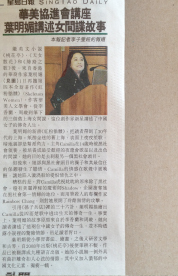 Hong Kong University book event 2-7-13 http://evideo.lib.hku.hk/play.php? May 20 tues. Asian American Press, featured interview. June 6, World Journal, Weekly Magazine featured interview. 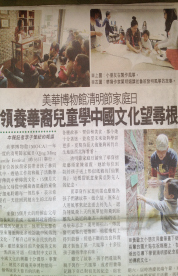 June 9, Sing Tao Daily News, featured interview. June 11, 6:30 pm live Radio Interview, WGBB Tonight, LMB Davidson Productions. Aug 4, 1:00 pm, KRCB, “A Novel Idea,” I will be interviewed for an hour to talk about Chinese Courtesan culture and Peach Blossom Pavilion, Sonoma County, Northern California. Aug. 22 Fri. 12:45am, Singtao Daily News Radio Station, San Francisco, featured interview of Mingmei Yip and Peach Blossom Pavilion.